MyMemories Suite MyMemories Version 3 is finally here! * New Features * New Content * Fresh New Look! 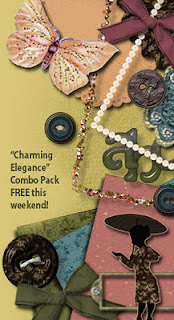 The “Charming Elegance” combo pack is FREE all weekend! This vintage style kit comes with 10 papers, 23 page embellishments and a monogram set of 84 characters. Regularly a $4 value, this kit is free through Sunday. When you come by to get your free download, you might want to check out all the other new kits available. It is the season for great memories, and our design pros have been busy providing new kits for every occasion. Want to give a gift that is personal? For a small investment you can make gifts for all of your friends and family! For the cost of just the software and the cost of printing pictures you can make gifts for ALL your friends and family. I do regular scrapbooking as well as digital. What I love about the digital scrapbooking is that it is so much more cost effective than traditional scrapbooking. It also is a tremendous time saver . If you have your software registered, you can upgrade for FREE if you purchased your V2 less than 30 days ago, and $9.97 if you bought your V2 between 31-120 days ago! *Using outside content in your My Memories Suite software* from Lisa Jurrens on Vimeo. Disclosure: I did receive a free product for review purposes and one copy to give to one of my readers. I did not receive any compensation for this post. I do have the opportunity to partner with MyMemories as an affiliate. For more information on this blog and on my posting practices please refer to the disclosure policy at the bottom of this page. "This holiday season the stylish do-it-yourself consumer is playfully personalizing projects like art, jewelry, wallets, handbags, ornaments and gift wrap with Designer Duct Tape. A gift, ribbon, ornament, tree – anything can be made more festive and fun with seamless patterns that put a little extra magic into every aspect of the season. Duct tape is one of the most versatile materials in the world". Platypus Designer Duct Tape has a new line of fourteen specialty designs. These are fun and colorful prints that add dimension, playfulness or interest to your project. Designer Duct Tape rolls are perfect stocking stuffers for the crafter / artist also! "One of the most innovative products to newly appear on retail shelves, Designer Duct Tap is the recipient of the 2011 “Retailers’ Choice Award” at the National Hardware Show®"
Disclosure: I did not receive any form of compensation for this post. For more information on this blog and on my posting practices, please refer to the disclosure policy at the bottom of this page. We all need pick me ups. It is easy to get worn down from day to day responsibilities and pressures. For the millions of military families manning the fort at home while their loved ones are away serving, a gesture of Cheer is especially welcome. When our troops are called to serve, their families are impacted as well. They must rise to meet the challenges of service as well. To thank these families, Cheerios® and the USO have partnered in a postcard campaign that spreads Cheer directly to these honorable military families and supports USO programs. Here´s how it works: Now through November, 2011 at your local grocer, specially-marked boxes of Cheerios cereal will feature Cheer postcards on the front of the box. Consumers can simply cut out the postcard from the Cheerios logo, write a message of thanks on the back, add a stamp and mail the pre-addressed card to the USO. The USO will deliver the Cheer card to military families across the country. For each postcard received through November 2012, Cheerios will make a $1 donation to the USO to help fund programs that support military families. To kick off the campaign, Cheerios has already donated $150,000 to the USO and will donate up to an additional $100,000 based upon the number of postcards received from specially marked boxes now through November 30th, 2012. Sending a "Cheer" postcard is a simple way to say thanks and lift the spirits of our country´s military families. So, take a moment out of your day to spread some Cheer and send a message of thanks! Cherrios wants to spread the word about this program. As a result I will be hosting a fun giveaway to promote Cherrios cheer. Labels: breakfast, cereal, charity, giveaway, kids, product review. We love chips and salsa - I especially like foods with a twist, so the numerous varieties of salsa were especially appealing. 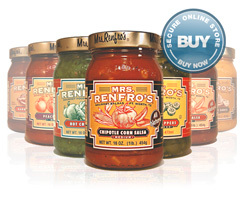 When the opportunity to review Mrs. Renfro's salsa came up, I jumped. · Easy to use – every label has a simple and tasty recipe right on the label to give you creative ways of cooking with salsa. You can also view more recipes on their website. · Perfect for time-pressed families looking for healthy, delicious meals while getting the best value for their money. The Mrs Renfro's Salsas arrived quickly and safely - they were packaged securely to minimize the change of breakage during the shipping process. These salsas and the relish are great! Our favorite was the Mango Habanero - we both loved the sweet and spiciness. We both could not stop eating it. This would definitely make an impression! I also really liked the tomato relish. It is very spicy but gave a nice kick to my sandwich. I also cannot wait to try this in my soups and over beef or chicken. I have not tried the green salsa yet but the Roasted Salsa is another winner! This is more traditional but has a rich wonderful fire roasted taste..